We are dedicated to helping you find the cheapest prices in the UK for DVDs. Our price inspectors have hand picked some of the most popular DVDs available to buy in the shops today, and have outlined some of the most searched for DVD phrases. We have also suggested some related categories if you want to see a larger selection of DVDs. Make sure you check back soon to this page as we will be updating it regularly, and offer some great buying tips and advice for you to consider when buying a new DVD. 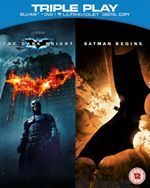 Dark Knight Returns Part 1 DVD £6.49 Batman has not been seen for ten years. A new breed of criminal ravages Gotham City forcing 55-year-old Bruce Wayne back into the cape and cowl. But does he still have what it takes to fight crime in a new era?